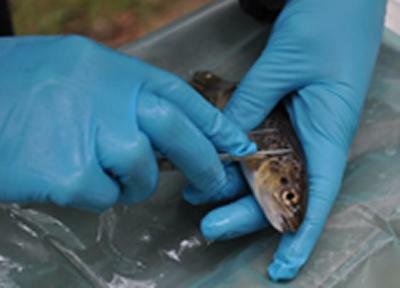 Research at the University of Southampton is protecting fish that inhabit rivers and estuaries impacted by dams and power plants. Biologist Dr Paul Kemp, from the University’s International Centre for Ecohydraulics Research (ICER), helps engineers developing hydropower to understand fish behaviour and come up with innovative ways to keep them away from turbines and intake systems. Dr Kemp is looking at behavioural attraction and repulsion and other aspects of fish behaviour, including distribution and routes of migration. Some fish, such as salmon and trout, exhibit avoidance of some hydrodynamic cues, such as acceleration of flow. This can reduce the number that may go down an abstraction point, for example into a turbine or other water supply off-take, but is negative when wanting fish to go down fish passes that also tend to have accelerating flows. “Fish ladders are not new technology. There are records in 13th century England of a need to provide a space within weirs to allow salmon to reach upstream spawning grounds, which had to be wide enough to allow a well fed pig to stand sideways without touching the sides,” says Dr Kemp. “It’s thought this ‘King’s Gap’ dates back to the days of Richard the Lionheart, but we need to be more sophisticated now to protect species from harm. “What we really want to do is to tap into aspects of fish behaviour to manipulate their distribution and movement to increase the probability of deterring them from hazardous areas, such as turbine and water supply intakes, while diverting or attracting them to other preferred routes, fish passes for example,” Dr Kemp adds. Work in this area has historically focused on salmon but has now broadened to include several species of fish that could be threatened by engineering work to modify rivers and control the flows of water. Research is underway around the world including China’s Yangtze River, and the mighty Amazon and scientists at Southampton use the flumes at the University’s science park to examine fish behaviour in response to hydrodynamics encountered at dams. Another major area of Dr Kemp’s research concerns eels, after their population fell by 90 per cent over the past two decades. The adults, which leave freshwater rivers to swim thousands of miles to the Sargasso Sea to spawn and die, are replaced by their tiny young that make the arduous trip back to populate European rivers. Due to the collapse in eel stocks, this species is now protected by EU legislation and the CITES (the Convention on International Trade in Endangered Species of wild fauna and flora). However, both adult and young eels, called elvers, are still at risk of being sucked into water-cooling systems at power stations or being chopped up by hydropower turbines. Much work remains to be done in protecting the eels; researchers at Southampton are investigating whether changing the lighting or acoustics near inlet pipes could encourage them to keep away.